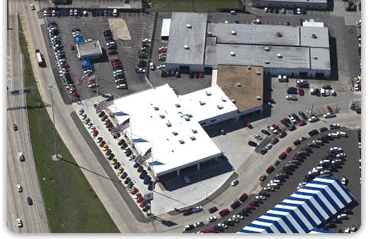 Young Chevrolet, a Dallas-area car dealership, decided that they needed a solution to the leaking built-up, tar-and-gravel roof over their new car showroom – one that would also lower their high utility costs. 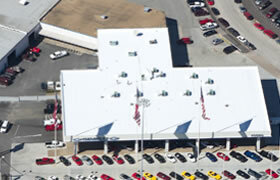 They selected DFW Urethane to retrofit their existing roof with a sprayed polyurethane foam roofing system. A primary advantage was our ability to re-roof the facility without the need to completely tear off the old roof, which would interrupt their retail business. Our greatest challenge was the rows upon rows of new cars that were subject to overspray hazard – as well as any potential falling debris from the roof. Because the owner was unable to relocate vehicles, we had to take extra precautions and be particularly careful in removing loose gravel from the original tar-and-gravel roof before the application of the polyurethane could take place. We also designed and constructed a custom spray enclosure to minimize any risk to the car inventory. The commercial roofing project was completed with absolutely no damage to property from falling objects, and no overspray, resulting in a rating of 100 percent for customer satisfaction.